It's snow day number two in north Texas and the coldest day on record in the last 15 years. The sleet and snow that fell on Monday night thawed a bit yesterday when the sun was out, but it all re-froze last night and today is cloudy with temperatures staying in the teens. We're staying inside today. February is Rachel's month for the do. Good Stitches bee. She asked for wonky stars in pinks and reds. Pink is something I seem to have no shortage of. I hope you like them, Rachel. The are making me crave some Valentine Sweet Tarts﻿! I started this quilt back in November for my cousin's new baby. I intended it to be finished before she arrived, but she was born on January 5th and the quilt was still stuck on the design wall waiting to be assembled. I focused last night and got the top finished. I can't decide how I want to quilt this one. The last time I did meandering free-motion, it looked terrible and I don't want to mess this one up. Any suggestions for something quick and easy? The blocks in this quilt are from an American Jane pattern called Popsicle Posies and the fabrics are an assortment from my stash. Love the blocks. LOVE the quilt! I would probably just do a simple crosshatch along the diagonal lines. 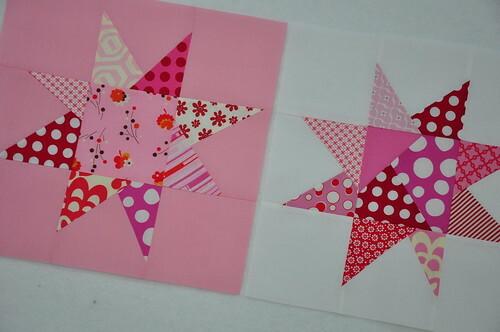 I would just do every second block so the quilting would cross in the middles of the pinwheels. Hmmm . . maybe a double line every second square. however, i don't mind straightline quilting and am terrible at meandering. Love the colours. I love the quilt. I would probably do a stitch in the ditch around the petals and if that isn't enough I would stitch diagonally from the center out like veining in leaves to supplement. wowowow! I LOVE those blocks! Straight line quilting would look great as a contrast to the curved piecing.....cute quilt! I really love that quilt, both the pattern and the fabrics. Exactly something I would make! Very nice, that baby girl will be lucky to get that. I agree - crosshatch on the diagonal. And, of course i love your stars! I like that pieced center one - fun idea. OMG!! That is a frickin' adorable quilt!! holy cow!! great color combo!! Wow! The quilt is just gorgeous! 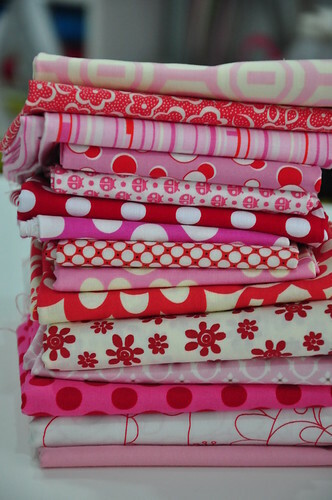 Love the fabrics you chose. What a neat looking quilt.I came across your blog today.It's neato to find someone else in the same state as I am. 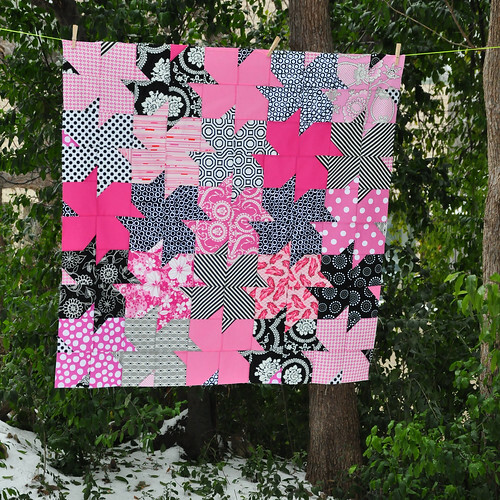 The black and pink is so striking, I love it, but am no help in suggesting how to quilt it. That is always one of the hardest decisions for me. How about echo quilting each segment. I think that would look really pretty! You could start on the outer most line and work in or vice versa. Start from the center and work out to the end of that segment. You could echo just a few lines instead of every 1/4 inch. Wow! What a fabulous quilt. Lots for a growing baby to look at with the strong lines and contrast. Besides, it's just plain gorgeous. Hello - just came across this quilt - does it have a pattern name? It looks great - I love it!!! Melanie, I puchased your cheater quilt from spoonflower and was very disapointed because it faded so much after the first washing. I decided not to proceed with a cheater quilt because I did not want to put so much work into something that faded so much. I love the pattern though. sigh.